Meat Toppings: Canadian Bacon, Grilled Chicken, Italian Sausage, Italian Sausage Link, Pepperoni, Salami. Veggie Toppings: Banana Peppers, Green Olives, Green Peppers, Minced Garlic, Mushrooms, Onions, Pickles, Pineapple, Sauerkraut. Cheese: Extra Cheese. A Cheese Pizza (no toppings). The Calzone is made with our homemade crust, Carbones pizza sauce, 1 topping of your choice and covered with shredded mozzarella cheese. Sausage, Pepperoni, Canadian Bacon, Salami. Onions, Green Peppers, Mushrooms, Black & Green Olives. Olive Oil, Tomatoes, Basil & Mozzarella cheese. Served with Marinara sauce on the side. Grilled Chicken & Mushrooms with Mozzarella Cheese in Alfredo sauce. Sausage, Pepperoni, light Onion, Oregano, Basil, Parmesan cheese, crushed Red Peppers. Crisp lettuce covered with red onions, green peppers, green olives, mozzarella cheese, cheddar cheese, pepperoni, salami, tomato and croutons served with toasted garlic bread and your choice of dressing. Crisp lettuce with tomato, mozzarella cheese, cheddar cheese, turkey, ham and croutons served with toasted garlic bread and your choice of dressing. Grilled chicken on crisp iceberg lettuce, romaine lettuce, parmesan cheese and croutons, served with our own caesar dressing and a slice of toasted garlic bread. Crisp lettuce topped with red onions, tomato, green peppers, cheddar cheese and croutons, served with your choice of dressing. This sub comes with Mayo, Lettuce, Tomato, Red Onions, Cheese and our House Dressing. This sub comes with Mayo. Lettuce, Tomato, Red Onions, Cheese and our House Dressing. This Hoagie is Loaded up with Cheese, Tomatoes, Lettuce, Onions and Fresh Bread spread with Real Mayonnaise, and Special Dressing. Sliced ham and turkey with ranch dressing, Parmesan cheese and melted mozzarella cheese on toasted Vienna bread. Served with chips and a pickle. Our delicious 1/3 lb meat patty covered with marinara sauce on toasted Vienna bread with banana peppers and mozzarella cheese. Served with chips and a pickle. Made on a toasted bun with our own homemade meatballs, covered in marinara sauce, with banana peppers and melted mozzarella cheese. Served with chips and a pickle. Four slices of bread brushed with garlic butter and lightly toasted, served with our on sauce. Four slices of garlic bread smothered with mozzarella cheese, toasted and served with a side of our sauce. A light and crispy crust brushed with garlic butter and mozzarella cheese. Served with a side of our sauce. Lightly toasted bread sticks brushed with garlic butter and a side of our sauce. Tender wings smothered in hot n spicy sauce, served with ranch or blue cheese dressing and celery sticks. Enriched noodles covered with our homemade Italian sauce, served with meatballs and garlic bread. Rigatoni noodles covered with our homemade Italian sauce, served with meatballs and garlic bread. Hand layered noodles in a rich tomato meat sauce with blended cheeses, served with garlic bread. Four homemade meatballs covered in our sauce and melted mozzarella cheese. Served with garlic bread. Grilled chicken on enriched pasta, covered with our homemade Italian sauce and topped with melted Parmesan and mozzarella cheese. Served with garlic bread. Pepsi, Diet Pepsi, Cherry Pepsi, Mountain Dew, Diet Dew, Mug Root Beer, Dr. Pepper or Sierra Mist. Ci sono stato tre volte. Sperando di esperienza migliore.? Pizza sottile, ingredienti negozietti, non c'è molto di qualsiasi cosa. Molto elaborati. I bambini non sembrava, hanno mangiato comunque. La cosa migliore di pizza è il costo. Best Pizza in città, menu italiano, molte opzioni nel menu. Big Bingo giochi in inverno e autunno mesi. Pizza meravigliosa e un Margarita è fantastico! Il cibo di Comfort. Puoi sempre contare su Carbone è di dare la stessa deliziosa pizza time after time. Comfort Pizza. Migliore pizza intorno. Servizio ottimo. Bella atmosfera,pulita e spaziosa. Hanno avuto pasta che è buono, ma io sono un grande fan di carne sottile crosta topping pizza. Solo posto per me per pizza. Amore - la nostra pizza preferita di consegna! 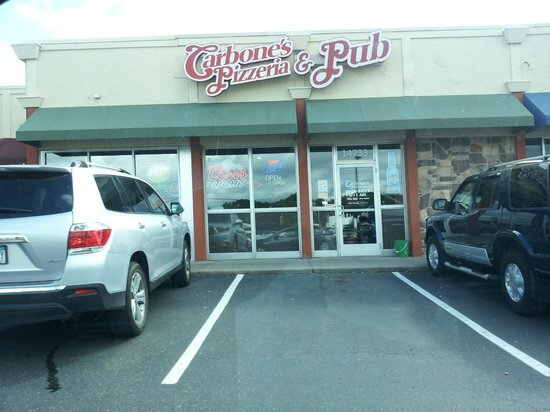 Ricevi risposte dal personale della struttura Carbone's Pizzeria e dai visitatori precedenti.